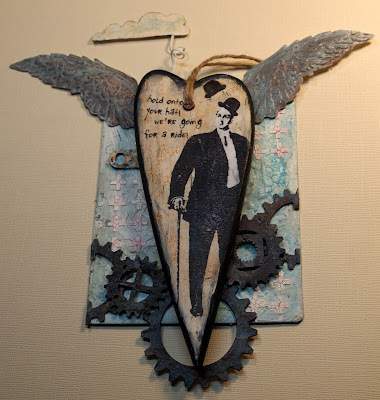 Hello, hi, servus and welcome (back) to our little mixed media steampunk corner in challenge blogland! 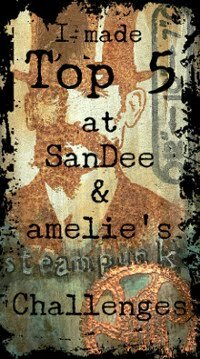 and as always it is an "anything goes" as long as it is somehow steampunk or industrial style-ish and follows our few and simple challenge rules. 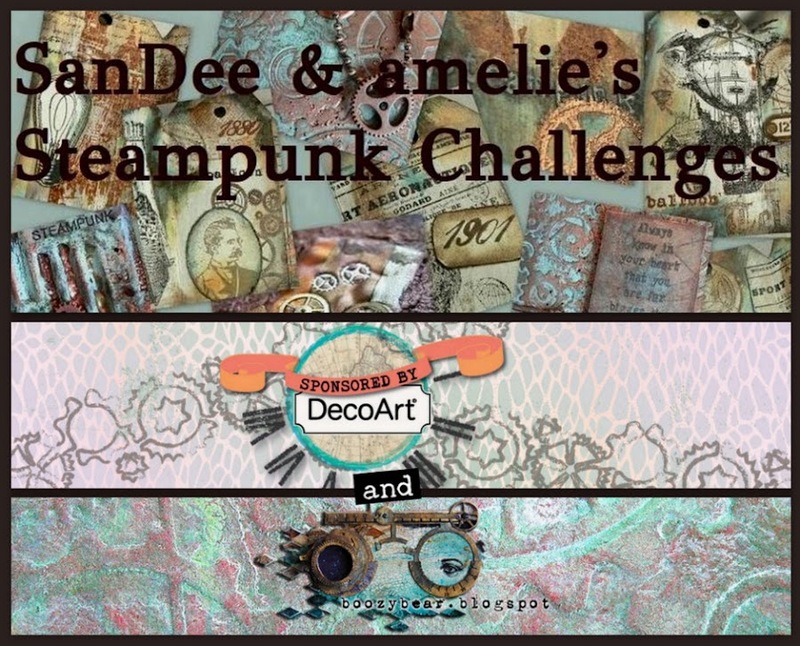 And as I know (and have already spotted during my visits via facebook or blogger) that many of you have already created some awesome steampunk mixed media stuff in January but couldn't enter it due to the challenge theme back then I will only this once allow makes from January being entered too! But only this once!!! Simply because it would be a shame if you couldn't share them on here, right? 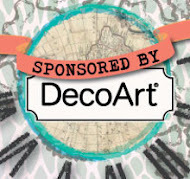 So IF you have already used some of your new stash and created a project - share! And if you are only starting on one - share too (as soon as it is finished)! If you use just one of the two or both - new AND forgotten stash - is all up to you. But, please, name the new/forgotten stash in your posts! My wonderful team have been very busy and creative again - so a bundle of awesome inspiration is waiting for you!!! Here we go! received a new toy for Christmas - a button maker machine! 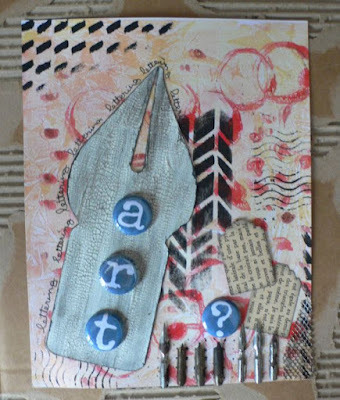 So you can find some awesome selfmade buttons (or badges) on her lovely mixed media journal page. 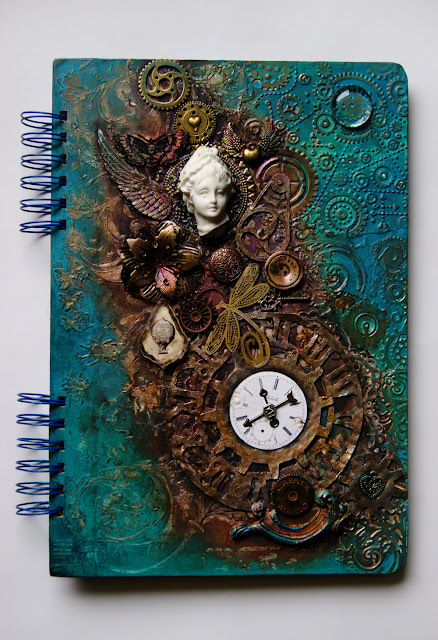 She once more used one of her fab Gelli plate backgrounds. and forgotten stash : golden dragonfly and papers. 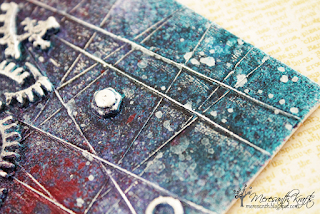 "Many, maaany years ago my crafting journey started with jewellery-making. 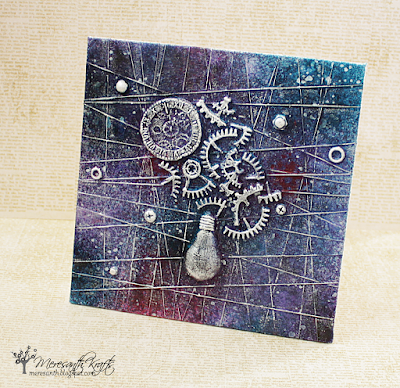 I've recently discovered a forgotten stash of wire from back then and decided to use it as part of my background, in combination with my new stash of beautiful colors of DecoArt Misters." and has created a book box to store them in. decided to use both - new and old stash on her lovely heart wall hanging. There will be more inspiration from Team B on the 15th as usual and you are also invited to visit the teamies' blogs to find out more about their makes and if you want to make them happy, please, leave a short comment on their blogs so they know you were there and liked what you saw! Thank you! You get to their blogs by clicking on the names. oh boy, love the projects from the team. I have one that has been a looong time in the works and I'm determined to finish it for this challenge! Wonderful projects for the team!